Have you ever stayed with someone because you didn’t think you could find someone better? I have. I thought I wouldn’t be able to find anyone I could get along with better, who would treat me better, or understand me better. So I stayed. Even though I had this nagging feeling inside me that it wasn’t right. But I couldn’t bring myself to believe in the idea of “better things to come”. Was I too pessimistic? Perhaps. Although I’d like to think of it as me being blinded, or rather, blindfolding myself. So I stayed. Blinded. Thinking that I couldn’t have found someone ‘better’. I had the same attitude about fries too. I loved my plain salted fries and didn’t think there would be any other type of fries that could taste better. There were other fries out there, screaming out at me, pleading for my attention. But I didn’t care. They couldn’t possibly be better. So I stuck to the usual. Blinded. Until recently. 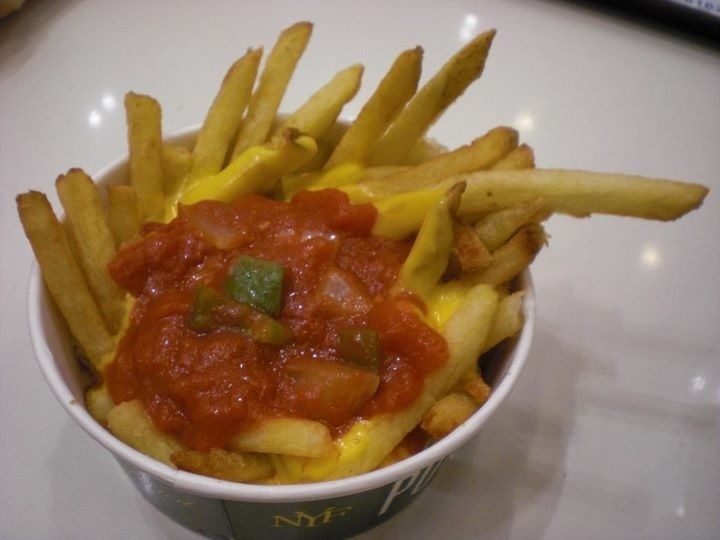 Thanks to New York Fries and their Nacho fries, I discovered that ‘better’ did exist! And more importantly, that I could have it! They were easily the most delicious fries I’ve ever had in my life! Not long after, I was proven wrong again. Very wrong. Contrary to my belief, there was someone out there, who was better for me in every single way that I never thought possible. As I’m writing this, my mind is still blown away by this recent discovery. But it is real, and ‘better’ is real. The most important thing I learned is that ‘better’ things came to me only when I allowed myself to be open. I removed my blindfold and took a chance. Because ‘better’ can’t happen when you’re blinded or closed off. So make this your mantra for today: open your eyes, open your heart, and embrace all the ‘better’ things that will come into your life. I honestly couldn’t answer. I didn’t think it was possible. I now understand how wrong that was. It’s important to know your own worth. Good one – that was your best post SO FAR. Better yet to come!